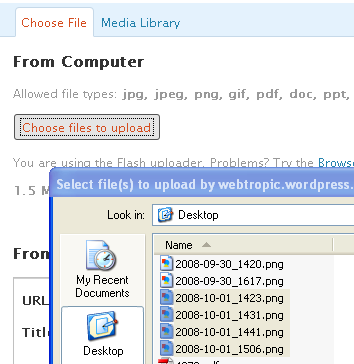 I added a Lifestreaming plugin to my blog recently and as I was entering the feed urls of the various Web 2.0 sites I am participating, I stumbled upon the Facebook problem. Since its last change, the old mini-feed feed has disappeared, so one has to reassemble it by its components. I was particularly interested in the Noted Feed, the Links feed and the Status feed. Well, the notes is the facebook blogging. Although I rarely use it, it can occassionaly contain some thoughts that are posted nowhere else. The Links feed is essentialy the feed of all the sharing activity in facebook, so it is a must to include in a lifestream. Working as with notes we can find it at a similar place. Last, the Status feed is the most important one, especially if no cross posting is taking place on your Facebook Wall, as it comprises of all the original thoughts and situations you share in Facebook. But where is this feed located? As much I have searched I could not find it. So after discussing this in twitter, from the responses I realized that the structure of the statuses feed url must be the same with other two feed. First guess: replace notes.php with status.php and … voila, it works! I am ‘locked’ up today in my mother’s house, which, quite unsurprisingly, does not have internet access. One option is to steal my way to the net through a neighbors’ open wifi. Not without some odd problems though: I can open my Gmail in https, send and receive mail as normal, I can browse pages in https (where supported), I can use a twitter desktop client, I can use twitter through (you guessed) https, but every other simple web page request through http fails! But problems can make one creative! Having encountered the same situation before, this time I came prepared. I had preset my MacBook Air and N95 for tethering and I could surf the web with no restrictions. Well, almost, as my data plan isn’t for heavy use (it’s just a quarter of a Gb per month) . You’ll need a USB cable. Connect Phone to Mac and select PC Suite on the phone. One can achieve the same without a USB cable (through Bluetooth) but I did not try it, as bluetooth drains phone batter all to quickly. The above settings are specific for my provider, but you can get an idea how it would work with yours. A tip: do not confuse the APN (Access point name, with the connection name on your phone). Open your connection (the one you use to connect to the internet) and see the APN name there. Leave a comment if you have tried this on a different provider. I own various blogs. Most of them I channel to twitterfeed to generate notifications on twitter about new posts. I prefer twitterfeed to blog add ons as it is a generic solution independent of blog platform. It can be slow sometimes, but, then, who is in a hurry? I do not run news related blogs that sprint to catch the publicity moment. Today I tried to add a new blog to twitterfeed and this way I noticed that twitterfeed now supports various shortening services, my favorite one included: urlborg. When I post a link to twitter I try to use urlborg as much as I can because it provides me with valeuable statistics: how many times my links are clicked. The latter would be impossible without the use of a url shortening service that provides stats. And that is precisely what urlborg does for me. 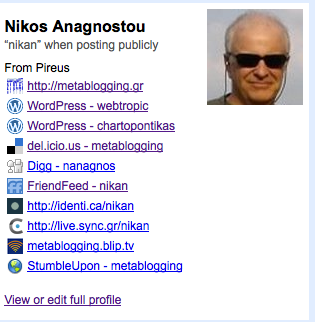 And, now, by employing it in twitterfeed, I can have also stats for the autogenerated links for my blogposts. I have to say here, that checking the referrers to my blog and the time spent on my blogs, I have observed that people coming from twitter stay the longest. Why is that I do not know, but it is something I cannot ignore. One could argue that I could derive the information about twitter originated visitors from other sources too, like Google Analytics. True, but too many clicks away. I had this old Gmail account and all its paraphernalia (Google Reader, Google Docs, Analytics, etc) which was named after a ‘nick’ I used in my first blogging days. Recently I decided to consolidate my various email accounts in Gmail and since some of them were business accounts I did not want customers to see a mail proxied by a strange nicknamed email account. So, I decided to move my old account to a new one named after an abbreviation of my real name. Now, this sounds simple but it is not. Here is why and how I did it. Gmail: In old account go to: Settings>Forwading & Pop/IMAP and enable IMAP. In the new account go to: Settings>Account>Get mail from other accounts and set to receive mail from your old account. Depending on how old is your account and how many messages does it have, it is going to take a fair amount of time for the new account to get all the old messages. In my case it took approximately 24 hours. Google Reader: Since your gmail is tied to a google account, your Google Reader will be, presumably, under the old account and you would want to move it too. There are two tasks to undertake here, an easy one, and a difficult one. The easy one is to move your feed subscriptions and it is easy because Google Reader provides us with the tools: Log in to google reader with your old account, go to Manage Subscriptions >Import/Export and export your subscriptions as an OPML. Then log out and log in again with your new account, go to the same place, only now do an import of the OPML file you exported before. Now, the difficult one: you want to bring in the new Google Reader, the friends you were sharing with. You have again two options here: share with a selected list of friend, or share with all your contacts. 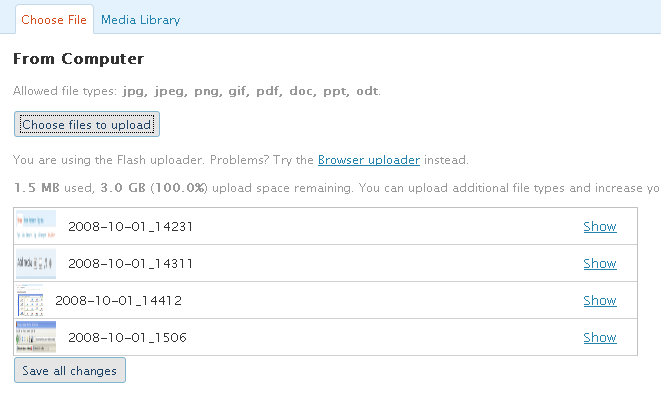 Google has a cumbersome process for making ‘friends’ in Google Reader. Basically, the people you share with have to be Chat contacts, and you need to explicitly ‘invite them to chat’. You start by opening once again your old Gmail account, going to contacts, selecting them all and exporting them in a csv file. From the same point but having logged with your new account, you perform an import of the .csv previously created. But the work just starts: you can use the setting ‘Share with your chat contacts‘ so that everyone in your chat list sees what you share, but there is no way to get the others to share back with you automatically. You have to ask them. I did it both by sending email and announcing the fact in twitter. On the other hand, if you want to share with only selected people, you have to invite them one by one, in chat. 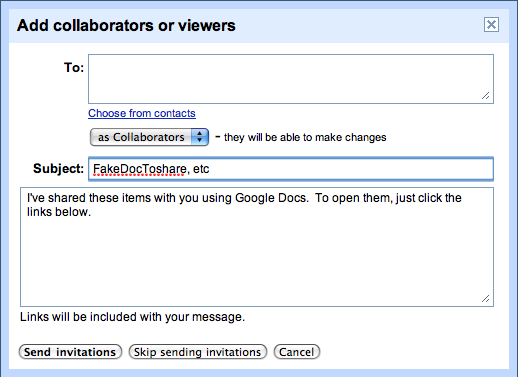 Google Docs: For your old Google Docs you can take the painstaking approach and export each one of them and then reimport them in you new account (highly improbable) or just select all the documents and share them with … yourself under the new gmail account and as a collaborator. Last but not least, in the Analytics part. Again, the things one will be required to change/tranfer/move depends on how many Google Products/Services was using. I have picked only these four (Gmail, Google Reader, Google Docs and Analytics) because this were the ones I had the most stuff on. Now, analytics is a bit different from the other Google services: there is an analytics account which is not identical with the Google Account. 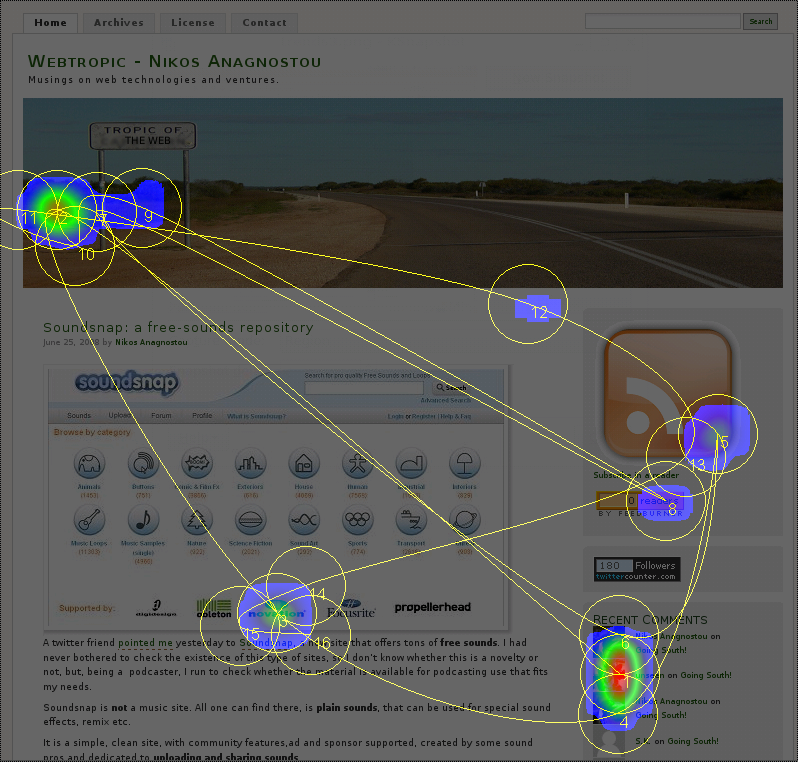 Websites tracked are set as web site profiles under the analytics account. Assuming you were using analytics, these should already be in place but each profile has an admin which must be set under your old gmail account. Login to analytics with your old google account and add as new admin to each website profile your new account. 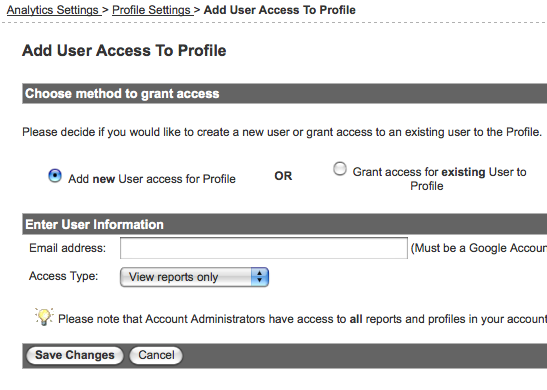 Then, log in to analytics with your new account, go to each profile and delete the old admin.